So what persuaded me to give up the streamlined logistics and look of a truck in favor of a trailer? I know my limitations. It will come as no surprise to anyone who’s been reading about my trailer and building renovation journey that I’m just not great with mechanical stuff. Just like plumbing, wiring, and exhaust work isn’t my thing, I’m no good at car stuff at all. I’d rather spend my time making pies than worrying about transmissions or engine issues. Worst-case scenario. If something mechanical goes wrong on a food truck, you’re not only worried about how much it will cost to get it repaired; you also have to face losing money. 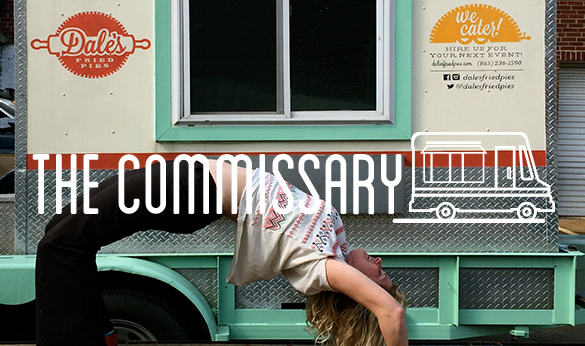 As long as your food truck won’t run, you won’t be able to sell food and make money. If, heaven forbid, something in your truck is just not fixable, you’re stuck building or buying a new one. With a trailer-based setup, you might at least able to borrow or rent a new vehicle if the truck you use to tow your mobile kitchen has problems. Flexibility. There are other benefits to running a trailer. You’re able to fit into smaller spaces because you can drop your trailer and move your towing vehicle. This means you might save on booth fees at events where they charge by the space, and you might be able to squeeze into venues where a truck won’t fit. In terms of design, a trailer is more adaptable. Mine was used to serve barbecue and has a little porch on the back where the smoker sat. 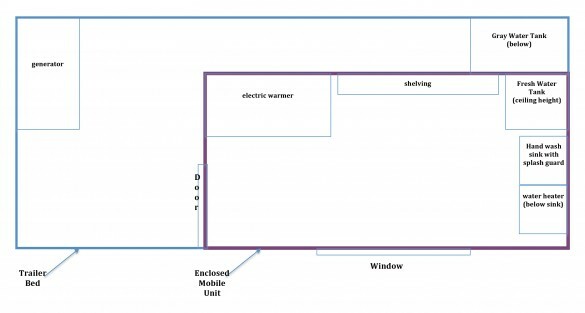 So, in addition to a mobile kitchen, I’ll have space for a table and chairs, or even for a “back-porch concert” with a musician at the end of the trailer. I will admit that I’m a little nervous about learning to maneuver the pie trailer. It’s harder to back up than a traditional truck, so it’s going to take some getting used to. I’ll keep you posted about how that goes, but in the meantime, if you happen to be in Knoxville, Tennessee, and you see a nervous-looking woman backing up a food trailer very slowly, just be patient with her for now. Having scaled my trailer back from full service to simply serving prepared and packaged pies, I’m anxiously awaiting its completion. Meantime, I resubmitted my plans to the health department to make sure that changes I’ve made will pass their inspection. It was a nice reminder that the health department is not out to get you. They just want to stay informed about projects as they progress so that they can be properly inspected. Nor does the health department require a fancy or impressive plan. Keep plans simple. 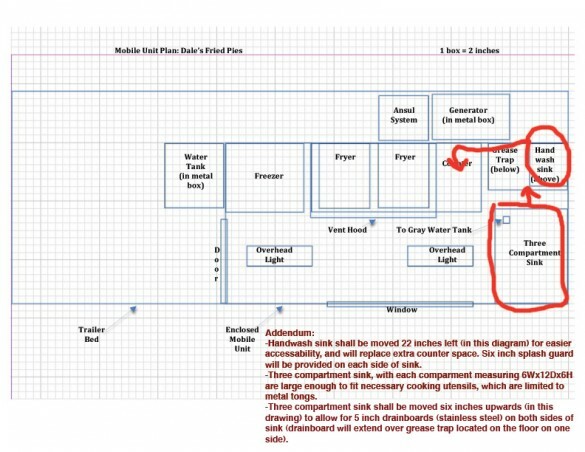 Plans just need to be easy to read and clearly show where the required equipment will be located. The ones I submitted were very simple. No fancy software was involved; I literally made a drawing in Microsoft Word, using the margin rulers as a guide for scale. The original plans showed a hood, refrigerator, fryer, grease trap, and fire suppression system crammed into a 4-by-8-foot space. I had also allowed very little space for accessing a hand-wash sink and forgot to indicate drainboards for my three-compartment sink. You can read the health department’s notes to that effect on the plans. Space first, stuff second. I should have known from the beginning that it was never going to work. Now, the trailer has a lot more breathing room, and the only equipment inside will be an electric warmer, a freshwater tank, water heater, and hand-wash sink. For a lot of food trucks and trailers, this setup wouldn’t work. But because I’ll be preparing my pies in a commissary kitchen, I won’t need a lot of the equipment that takes up space and requires approval from the utilities board and the fire marshall. You can see the in comparison between the old plans and the new plans that I wasn’t leaving much space for my pies or myself. The health department ultimately approved the old plans, but they still didn’t really work when we set about making them a reality. I still sometimes wish I were able to fry pies in my mobile kitchen, but it just didn’t make sense to buy an entirely new trailer at this point when I’d already gutted, painted, wired, floored, and walled the one I have. Maybe someday I’ll pursue a full-service trailer, but for now, I’m happy we cut out the excess. Dale Mackey is a Chicago native who moved to Knoxville in 2007 and has no plans of leaving. She spends most of her time making and selling fried pies, but when she finds a free moment, she enjoys writing, eating, playing with her cats, playing with her husband, and going on adventures. She's named after cowgirl Dale Evans, and hopes she does her namesake justice.